Because he stood at 6' 4" and weighed 180 pounds, had long gangling limbs, and a somewhat sunken in chest, and add to that his ( I'm not going to use ugly or homely ) dysmorphic face, Abraham Lincoln became a prime target for political cartoons following his nomination for president in 1860. Albert Shaw, editor-in-chief of the American edition of the magazine Review of Reviews, reproduced in the Review a selection of cartoons that had appeared in the press between 1860 and 1864. A few years later, he published them in book form as Abraham Lincoln in Contemporary Caricature. I'm going to post a few of these cartoons, and if you know of any that appeal to you, please feel free to share them here. When a rumored plot to assassinate him on his way to Washington meant that the president-elect had to be taken through Baltimore in disguise, Harper’s Weekly published a series of four cartoons titled “The Flight of Abraham.” The third in the series showed a ridiculous, clearly not an “entirely unrecognizable” Lincoln in his purported disguise. 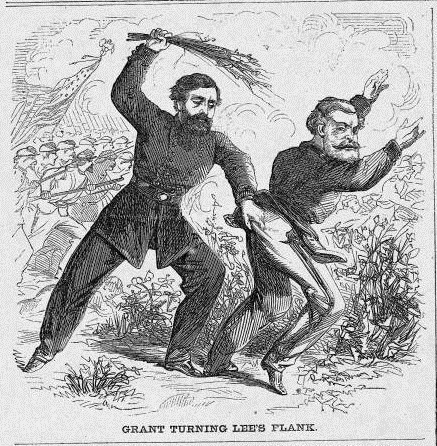 The 1863 draft spawned days of rioting in New York City and this cartoon in Frank Leslie’s Illustrated Newspaper. Lincoln, dressed as a nursemaid, tries unsuccessfully to deal with “naughty boy Gotham” who has thrown his dish labeled “Draft” and is having a kicking-and-screaming tantrum. In the background, a tearful Philadelphia has acquiesced to nurse Lincoln’s demands. During the 1864 campaign, McClellan was reportedly as deliberate and cautious in his activity as he had been when he led the Army of the Potomac. Lincoln is said to have quipped about his opponent, “Perhaps he is intrenching.” This Harper’s Weekly cartoon illustrated Lincoln’s “little joke” by showing a miniature McClellan with his tiny shovel in the palm of Lincoln’s hand. There is another source for Lincoln cartoons you might find interesting. From Rail-Splitter to Icon: Lincoln's Image in Illustrated Periodicals, 1860-1865, by Gary L. Baker. There is one cartoon from this book I especially like, entitled Santa Claus Visits Uncle Sam!, which shows Lincoln dressed as Santa, leaving such presents labeled as, Vicksburg, Gettysburg, Port Hudson, Morris Island, and Chattanoga, in Uncle Sam's stocking. After Lincoln issued the preliminary Emancipation Proclamation in September 1862, Harper’s Weekly published this cartoon. Here Lincoln is no longer ridiculous. Instead he is the strong frontiersman wielding his ax to fell the tree of slavery and defeat the Confederacy. A ragged Jefferson Davis cowers in the tree’s branches. Lincoln attempts to distract Liberty from demanding that her sons not be sent into battle. Because the number of volunteers were dwindling, Congress instituted a draft for the first time in 1863. They were calling for 500,000 men to fight for the Union. The order, signed by the President, lies on the floor at his feet. The political cartoonists probably couldn't believe their eyes or their luck when Lincoln arrived in DC- talk about fodder! One would hope the poor guy didn't read Harper's. Every, other page is Lincoln with a pen stuck through him although no one else got off very well, either. May be missing something but these old political cartoons are tons better than todays, comprehensively. Lincoln looks like Lincoln, for one thing! You don't always get that in modern papers, although it'd be tough finding one with Lincoln in it for comparison. Lincoln’s rifle is labeled "To Whom It May Concern." These were the opening words of a public letter written by Lincoln in July 1864 which included the stipulation that the Confederate states abolish slavery before the administration would accept terms for peace. Journalist Horace Greeley had discovered that two emissaries of president of the Confederacy Jefferson Davis were in Canada, and urged Lincoln to make an offer of peace. Lincoln sent Greeley to Canada, where he found that the diplomats had neither credential nor authority. Lincoln afterward announced that "Any proposition which embraces the restoration of peace, the integrity of the whole Union, and the abandonment of slavery … will be received and considered by the Executive government of the United States." I read he was pretty impressive with an ax. He must have been strong. This cartoon shows Lincoln writing a letter on top of a Union Drum. The caption states that " All seems well with us," meaning the country. Lincoln never considered the south to be a separate country, rather an angry neighbor. This is why the drum says U.S., not Union.
" The Little Joker for President." This cartoon was one of a series of six satires by Henry Louis Stephens for a British magazine. Most of his drawings were used in Frank Leslie's and Harpers during the war years. Abraham’s dream!–“Coming events cast their shadows before” By Currier & Ives, 1864. The artist portrays a President tormented by nightmares of defeat in the election of 1864. The print probably appeared late in the campaign. Lincoln was said to have believed in the prophetic importance of dreams. The President lies on a bed under a sheet embroidered with stars. In his dream Columbia or Liberty, wielding the severed head of a black man, stands at the door of the White House. She sends a frightened Lincoln away with a kick. Lincoln, wearing a Scotsman’s plaid cap and a cape and carrying a valise, flees to the left, saying, “This don’t remind me of any joke! !” The cap and cloak allude to an incident in 1861 before Lincoln’s first inauguration. On being informed that an attempt would be made to assassinate him on his way to Washington, Lincoln took a night train and disguised himself in a large overcoat and Kossuth hat. The press made the most of Lincoln’s timidity, and it was widely reported that Lincoln was seen wearing a Scotch plaid cap and a very long military cloak. At right General McClellan, in uniform, ascends the steps to the White House, carrying a valise with his initials on it. This cartoon from the Comic Monthly depicts Lincoln and McClellan (foreground) in a chariot race. McClellan's horses, labeled "War Democracy," seem to be slowed down by their attachment to McClellan's chariot, labeled "Peace Democracy" and "Chicago Platform." Interesting. What does the little caption in the upper left corner say? gambler playing his last card - The Emancipation Proclamation. Lincoln rightfully believed that by making the ACW a war against slavery, it would discourage the European Powers from recognizing the Confederacy. Restricted Debate What was the cause for President Lincoln's loss of confidence in General McClellan?